Just popping in to share this quick how-to for the energy bites I made today. I love to snack, and often crave something sweet, so these are the perfect alternative to chocolate, etc, also because you’ll likely only eat one or two as they are so rich. I realise that this is already a thing, but I haven’t made them before today, so I thought I’d share just in case you haven’t either. I’m not including measurements because I just combined everything in the food processor until it reached the right consistency. It also depends on your taste and how much you have on hand. 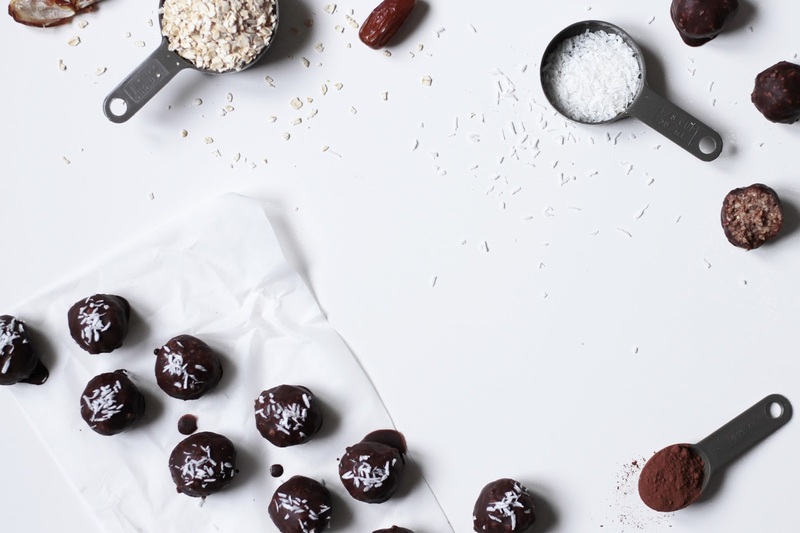 Once you’ve mixed the dry ingredients you can just add coconut oil and agave syrup until you have a sticky mixture you can form balls (or bars) with. These are really easy and quick to make and perfect for a little snack or to grab on the go. Combine all ingredients in food processor or chop them to small pieces and then bring all together. Form little balls, line them up on a baking sheet and let them harden in the freezer for a little while (~15min). Melt coconut oil and stir in the cocoa powder. Dip the balls in the cocoa mixture and quickly sprinkle with shredded coconut before they dry. Once the ‘chocolate’ has dried, fill them in jars and keep in the fridge.